Connoisseurs, members of the wine trade and particularly wine critics, are under the increasingly popular notion that unfined and/or unfiltered wines, because they are manipulated less and therefore considered more authentic, are superior in quality. Based on the experiences of some of the best winemakers in California, it can be concluded that wines of extraordinary quality are produced both with and without fining and filtration. Since these practices do not necessarily guarantee or compromise wine quality, the best way to evaluate a wine is by drinking it. Nonetheless, some producers trying to exploit the trend, attempt to boost sales by pandering to influential wine critics. But what the critics do not realize is that fining and filtration are indispensable to the winemaking craft and, used properly, can improve wine quality. After a wine completes fermentation, yeast, bacteria and fragments of grape cells are in suspension which make the wine cloudy. During aging, the wine clarifies as gravity pulls these particles to the bottom of the oak barrel or stainless steel tank, producing a sediment called “lees.” When this natural settling is insufficient to achieve a clear wine, fining or filtration is necessary prior to bottling. 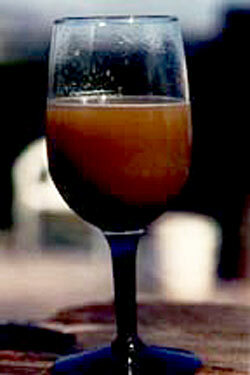 Fining and filtration are both used for clarifying a wine as well as to “stabilize” a wine. A stable wine will not undergo undesirable changes resulting from extremes of storage conditions such as temperature. It is not enough for a bottled wine to be visually brilliant because certain particles present in excess (tannin, protein) can become insoluble during the first 2-3 years of bottle aging, making the wine cloudy and, over time, leaving a deposit. Fining, a practice as old as winemaking itself, specifically removes tannins and proteins, ensuring its future clarity. Common fining agents for white wines are milk, casein (the protein found in milk), and isinglass (from the air bladder of sturgeons). Bentonite is a special fining agent added to remove protein in white wines. Otherwise, if the wine reaches a temperature of 80-90 degrees F, the proteins may denature (same as heating an egg white), appearing as a haze in the bottled wine. Bentonite is natural clay, carrying a negative charge which binds with and removes proteins, which are positively charged. Winemakers add the absolute minimum amount of bentonite because it can strip aroma compounds attached to the proteins. Red wines do not present problems with protein instability because the excess tannins react with and precipitate the proteins during fermentation. 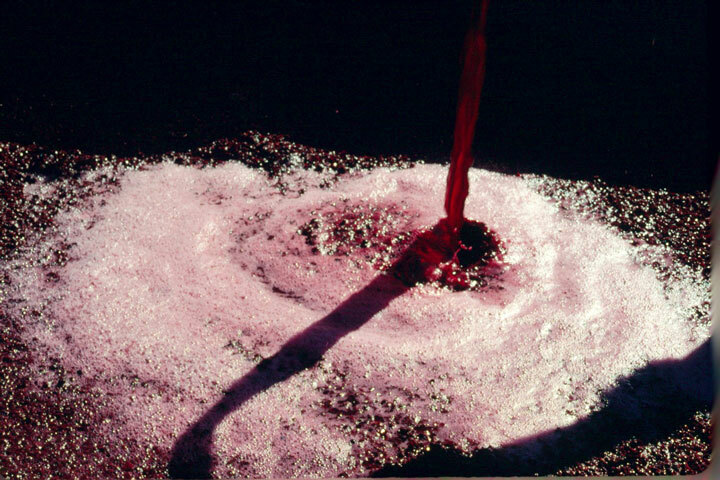 Fining agents also are used to clarify a red wine to the point where only a light filtration or no filtration at all is needed prior to bottling. But their more common use in red wines is to remove tannins, which reduces harshness. Common fining agents for red wines are animal proteins such as egg whites, gelatin and milk, all of which are positively charged. The attraction resulting from these opposite charges causes these substances to precipitate. The wine is then racked to separate the clear wine from these fining lees. 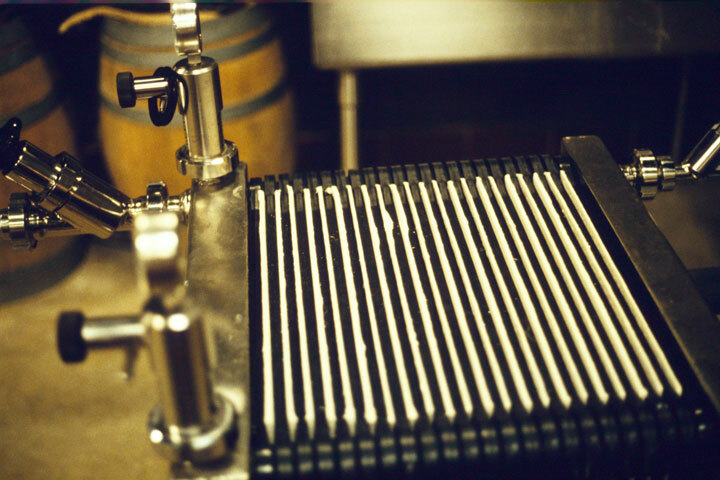 Filtration, a technique used for clarification and microbiological stabilization was introduced to winemaking only 30-40 years ago. The advantage of filtration over fining is that it can clarify a young, cloudy wine faster and more efficiently than fining. It clarifies by removing particles in suspension that cause cloudiness. Filtration not only clarifies visually, but by removing suspended particles can, from a sensory standpoint, make the fruit characteristics of a wine clearer and more vivid. Since some of these particles are yeast and bacteria, filtration plays an important role in the “microbiological” stability of a wine by eliminating the risk that these microbes will ferment undetectable quantities of sugar (or other food sources) still present after bottling. Filtration works by forcing a cloudy wine through a filter bed consisting of tiny pores which trap impurities. The most common materials used are cellulose fibers which are packed together into a pad. As the wine passes through, the fibers trap particles due to their negative charge and sieve-like effect. How densely the fibers are packed together determines the pore size and whether the filtration is rough, medium or sterile. A sterile or membrane filter, the most extreme filtration, is composed of cellulose fibers compressed to create pores in the filter bed small enough to entrap yeast and the considerably smaller malolactic bacteria. A key factor in determining the need to filter is whether or not the wine has undergone malolactic fermentation (MLF). This applies to white wines only, since all red wines undergo MLF. Unlike the alcoholic or primary fermentation in which yeast convert sugar to alcohol and carbon dioxide, the malolactic or secondary fermentation is carried out by bacteria which consume the wine’s malic acid, producing lactic acid and carbon dioxide. Since lactic acid is a weaker acid, the net effect is a decrease in total acidity, giving the wine a softer, more elegant mouthfeel. Another important by-product is diacetyl, the compound giving wine its “buttery” aroma. The MLF does, however, diminish the wine’s youthful fruitiness which is why it is rarely used for wines such as Sauvignon blanc, Riesling or Chenin blanc. Once the MLF is complete, the malolactic bacteria can remain in the wine because there is nothing left to eat. A filtration may not only aerate and therefore oxidize a white wine but may also strip the wine of desirable flavor and aroma compounds. Chardonnays from Burgundy and California’s coastal regions (Carneros, Russian River, Santa Barbara) typically undergo complete MLF’s. These colder climates produce grapes with higher acid levels which withstand the acid-lowering effects of the MLF, and therefore benefit from the stylistic changes. Since all of the malic acid is consumed, these wines do not need to be filtered since the malolactic bacteria have nothing left to eat. In California’s warmer growing regions (parts of Dry Creek, Alexander and Napa Valleys) where grapes are harvested with lower acidity levels, a full MLF will drop the acidity even more, resulting in flabby wines which deteriorate rapidly after bottling. The winemaker arrests the MLF by chilling the wine or adding sulfur, both of which inhibit the malolactic bacteria. A partial MLF gives some of the stylistic benefits but leaves malic acid behind. The malolactic bacteria present in the wine pose a risk because if they ferment the remaining malic acid in the bottled wine, the carbon dioxide produced will make the wine fizzy. Even the winemaker most ardently opposed to filtration must filter this wine to remove malolactic bacteria. Another factor influencing the filtration decision is the size of the winery. Small producers making a few thousand cases of l00% malolactic Chardonnay can get away without bentonite fining and certainly without filtration. The brilliant clarity resulting from filtration may not be as important given that their customers are more sophisticated and will accept the slightly cloudy appearance of a non-filtered Chardonnay as evidence of minimal handling. On the other hand, a producer bottling l00,000 cases of a $9.99 Chardonnay will expect these wines to be floor-stacked at Safeway. Without bentonite fining, these wines will throw a protein haze if temperatures in the Safeway delivery truck, warehouse or trunk of a customer’s car exceed 90 degrees F.
Producing an unfined or unfiltered wine at a small winery is considerably easier because the winemaker is overseeing, if not actually performing all steps in winemaking. One such step is racking which is the drawing off of the more or less clear wine from the lees. A Cabernet Sauvignon, for example, is racked four times per year with each successive racking yielding a clearer wine. As long as the racking is done properly, after two years of barrel aging the wine will be sufficiently clear to bottle without filtering. The reality of larger wineries is that instead of 50 barrels, there are l,000 barrels, requiring the winemaker to delegate the racking to several cellar workers making it impossible to have adequate control over this important step in clarification. The larger the production, the less flexibility the winemaker has. Each fining or filtration step removes some amount (difficult to quantify) of aroma from the wine but will presumably add a greater amount in terms of insurance against cloudiness, haze or sediment formation, or microbiological instability. Dave Ramey, the winemaker at Rudd Estate believes in fining as a way to minimize and hopefully eliminate filtration. “I have never bottled a wine without fining it. Fining is a time-honored, traditional, gentle technique and an indispensable aid to making fine wine,” he explains. For his Cabernet Sauvignon, he fines with egg whites. Ramey reports that, “The primary purpose of egg white fining red wine is to clarify the wine and therefore eliminate filtration. A secondary benefit is to specifically target tannins; this polishes, refines and finishes the wine, making it more supple and silky. The third is to remove unstable tannins which would otherwise throw a deposit after two to three years just when the wines are being consumed in restaurants.” Ramey also fines Chardonnay and Sauvignon blanc (both l00% malolactic) with isinglass and milk to make filtration unnecessary and to achieve the same refinement and suppleness he strives for in his red wines. David Graves, General Partner at Saintsbury, produces outstanding Pinot Noir and Chardonnay. Although Saintsbury is moving in the unfined and unfiltered direction, Graves comments echo Meyer’s, “Non-filtered wine is not always better than filtered wine. High quality is equated with non-filtration. This is nonsense because there are microbiological risks.” Graves concludes that, “for our wines this is the best way, but I wouldn’t recommend it to others. In l993, Saintsbury winemaker Bill Knuttel experimented with l,000 cases of non-filtered Chardonnay. “We preferred it over the filtered. It had a rounder mouthfeel. The fruit was not quite as clear but it had more complexity,” according to Graves. The added mouthfeel is believed to be caused by the presence of dead yeast cells which remain in the wine. It is believed that as the yeast cells break open (autolysis), they release certain constituents which improve texture and ageability by protecting the wine from the damaging effects of oxygen. Rochioli also produces terrific Sauvignon blanc from a vineyard planted in l959. He explains the challenges in producing an unfined or unfiltered Sauvignon blanc, “We must fine and filter Sauvignon blanc. The grape has higher levels of solids and proteins which impede settling requiring two finings with bentonite. Isinglass is also used to polish the wine prior to bottling. It is the only wine we sterile filter because I choose not to complete the malolactic fermentation. Kistler Vineyards’ Vice President Mark Bixler explains how the design of their new winery in Forestville in l992 has enabled them to eliminate fining and filtration: “We installed l6 stainless steel tanks, only four of which are needed to process juice during harvest. The l2 excess tanks are solely for settling wines.” Kistler installed this excess capacity at considerable cost to enable their Chardonnays to age an additional 6-8 months. Not only are they releasing wines with more bottle age but by achieving clarity during this extra aging time, Kistler eliminates the need to filter. Most wineries without this extra storage space are forced to remove the wine from tanks and barrels in June or July and bottle it to make room for the harvest in September. Kistler does not fine with bentonite. Nonetheless, the possibility for the wines to throw a protein haze is remote since Kistler ships his wine during the cool months of March and October; he asks distributors to use refrigerated trucks and besides, it is unlikely that a consumer purchasing a bottle of Kistler Chardonnay will let is bake in his/her car trunk. The use of fining and filtration says more about the individual differences between wineries and winemakers than these processes reflect in wine quality. Factors such as economics, production size, vineyards and stability concerns have a significant if not overwhelming influence on winemaking practices. Critics masquerading as enologists should be cautious about getting involved in whether a wine should be filtered or fined. Besides, since great wines are made both with and without fining and filtration, what difference does it make how the wine was made; the question is, do you like it?